A cheerful dispenser for those oft-used plastic bags! 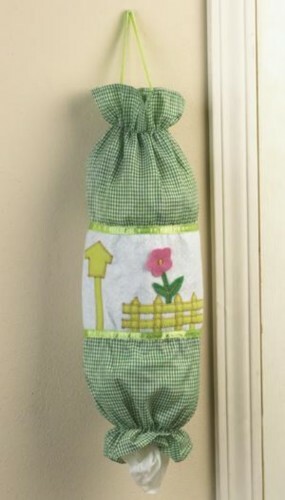 This creatively designed holder is made from green and white gingham with a felt inset that celebrates springtime with a bright pink flower and picket fence. It’s accented with satiny ribbon and gathered on both ends. Just insert bags through the top and remove them one-at-a-time from the bottom – for lining the trash can or picking up after the dog. Much more convenient than stuffing bags in drawers! Poly/cotton; about 17"L x 7"W.